← Creating high performance brands- When others zig, you need to Zag! I got a chance to spend some time with Nick Hughes this afternoon at the Said Business School over lunch. Organized by the Skoll Centre for social Entrepreneurship, he was here to meet with students to discuss the future of mobile payments. Nick was most recently the Head of Global Payments at Vodafone, where he started M-PESA, the world’s largest mobile money transfer service (with more than 10 million users in Kenya.) Nick initiated the M-PESA concept 2004 and grew the business unit into a multi-million euro P&L deploying M-PESA in multiple markets. Earlier, Nick set up an innovation fund within Vodafone to target opportunities in mobile services. Prior to joining Vodafone in 2001, Nick worked at BP, where he headed the climate change program for two years. He holds a PhD In Applied Science, and has an MBA with distinction from London Business School. Since I had nothing else to do on a Friday afternoon, I decided to listen to him, and it was well worth my time. In case you have never heard about M-PESA, you can read up here or watch one of their earliest commercials in Kenya. Or put simply, in countries where conventional infrastructure is lacking, low cost handsets + cheap airtime + widespread distribution networks = a revolutionary way to conduct billions of micro-transactions on a daily basis. Below I share some key notes I took from the talk. Getting started is the most important thing! Find a way to fund your idea! As a staff of Vodaphone, when Nick came up with the idea for a mobile money platform he was turned down by the Vodaphone CMO at the time and was only able to get started by winning one million pounds from a DFID-UK funding program. The good thing from this however, was that he was not constrained by big company concerns such as getting stopped if the project was not meeting targets after a few months, or the budget constraints of Vodaphone. Hence as an entrepreneur, getting that initial funding that allows you to move from the idea phase is key! Do not be disappointed by early rejection! There was no mobile-money platform back in 2003 that could be leveraged upon (there are over fifty today), hence Nick had to get a small team of programmers from the ‘other place’ (Cambridge University). The team was rough at the edges but was agile, and created something that was good enough to run with until IBM took over the platform three years later. Your initial business plan will change. Be comfortable with that! 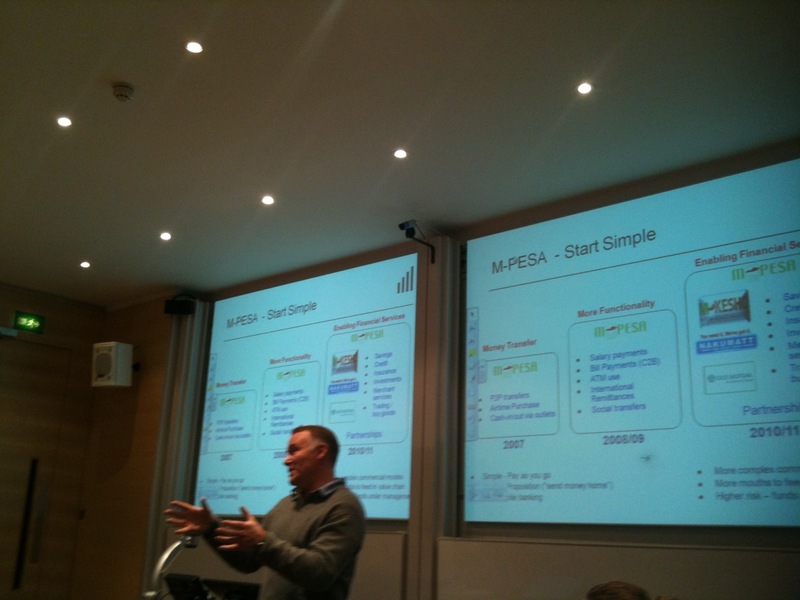 According to Nick, mpesa did not start with the goal of Peer-to-peer money transfer. The original idea was that of giving micro-finance loans. It was the era where microfinance was getting popular, and they thought they could help facilitate that through cell-phones. But as they launched in the market place, they found people were doing a lot of small money transfers from town to town (using the inter-city bus drivers) and were more interested in that than in loans. They listened to the market place, and mpesa became a peer-to-peer money transfer business. In Nick’s words “Find a way to put something in front of the customer as soon as possible, and then learn from the experience.” You need to move from ‘techie’ R&D to consumer-facing R&D as soon as possible! Keep your proposition to the customer really simple. His life is complicated enough! Do you know the number of startups where even the founders cannot describe what customer need they are satisfying in a simple sentence? Today, apart from the economic benefits to a mobile provider from customers using the mpesa card (an estimated 18% of Kenyan GDP moves about through the mpesa network in small amounts but in high volumes) , it also reduces churn (customer attrition) as a customer who uses an mpesa card on the Vodaphone network is likely to stay on the network. A lot of entrepreneurs over focus on technology, thinking having the best technology is what is going to win the market for them. By the time they find out it is not so, it is usually too late! This was probably the most interesting part of the talk for me as Nick spoke about why he left the mpesa team, and the work he was doing at the moment with Signal Point Partners. According to Nick, a few years ago, due to some leadership changes at Vodaphone, while he felt the need to expand beyond mobile money to other opportunities that leveraged upon the growth of mobile money, the new management was more interested in expanding mpesa to other countries, so he thought it was time for him to leave, and started Signal Point Partners ( to advise and invest in companies in emerging markets that use mobile phones to deliver basic services.) with a few folks including Jesse Moore, a former Skoll Scholar at the Said Business School, University of Oxford. Mobile Money is going to become a commodity, start thinking beyond that! Nick believes the recent acquisition of mobile financial services company, Fundamo, by Visa is a sign that things are changing in that industry. He thinks the acquisition is driven both by a feeling of threat to Visa’s business by the mobile money sector, and also a recognition of the opportunities in that sector. While this is a good development, it however means that given another five to ten years, mobile money will become a commodity in almost all emerging countries, the sector will become highly regulated, thus stripping the margins away, and it will no longer be enough to offer mobile money. However, this opens up a huge opportunity for entrepreneurs who can create services that are enabled by mobile money, and this is where the high margins are going to come from. With mobile communications and billing infrastructure in place, the next wave of big telecommunications growth will come from mobile services that provide low-cost access to the mass market for everyday tasks, such as moving money, calling a doctor, or trading goods. Signal Point Partners starts up and incubates early stage mobile services ventures that have the potential to become leaders in this new market. Interesting projects which Signal Point Partners are currently working on include Jipange Kusave, Kopa Solar and MeraDoctor. Jipange KuSave is an innovative Micro Loan and Savings initiative targeted at low income Kenyans who do not have access to traditional financial services, referred to as the “unbanked”. Customers will be offered a series of low value loans which will include a compulsory savings component, so that on completion of the full loan series, customers will have acquired savings and a credit history. Kopa Solar – This product uses mobile payments (smart chips in solar panels) as a way to pay slowly for renewable energy such as solar lighting. MeraDoctor – This is a new low-cost model of healthcare delivery in India targeting the mass market. Its initial Mera-Doctor product makes it possible for anyone to receive high-quality health advice and consultation via phone, anytime 24×7. In conclusion, this is a great time to be involved in innovating services that you can collect money for, over the mobile platform. It’s important to start setting up new services that telecom providers can buy up in five years time. But remember; start simple, build trust, while acquiring customers! This entry was posted in Uncategorized and tagged Africa, mba, mhealth, mobile, money, mpesa, oxford. Bookmark the permalink. For some weird reason though, I always consider Kenya to be a too orderly market used to this kind of outside solution for it to be a test of real entrepreneurial skills. Let us look at what aligned for mpesa here: they had vodaphone backing and infrastructure , they had $1 million to start, and they had that unlimited expense budget and orderliness offered by big companies. Most entrepreneurs in these markets don’t have that. And that is the challenge for entrepreneurs. Replicating these systems generically in an affordable manner. You are very spot on with your comment. Nick actually did allude to that especially in context of why mpesa has not had the same success in other markets. He mentioned what happened in India, where after they had done all the ground work preparatory to launching, the government came out with a new rule that only financial institutions (and not telcos) could run a money-transfer platform, and that stalled the launch. Pingback: » An Open Platform for Electric Car-Charging Networks? I am greateful for effiency m-pesa platform has created in kenya & being one of the regular user of the service i still believed its a product of an intelligent & creative mind of a kenyan origin but only hijjacked and merely developed by foreign companies,even the name itself suggest its a kenyan idea. Thanks to M Pesa Kenya is considered as Africa’s Silicon Valley aka Silicon Savanah with the like of iHub and Nairobi Startup Garage.